Joe Silva, Please move Bryan Caraway to UFC 157. Discussion in 'UFC Discussion' started by BROKENSPROKET, Dec 16, 2012. Having Bryan Caraway, boyfriend of Miesha Tate on the card under 'headlining' Ronda Rousey would be awesome. Who would you have him fight? I doubt Mizugaki wants to leave the Japan card at all. 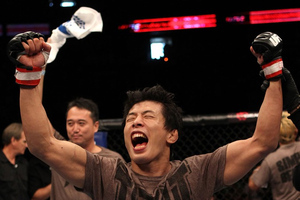 will mizugaki finally win 2 fights in a row? As did the majority of people who saw the fight. I would say Manny Gamburyan, but he is a featherweight. So, I guess I really don't care. I would just be nice to have him on the undercard after the physically threatening things he twittered to Ronda Rousey. All she said, to hype the fight, was that she could beat Miesha Tate's boyfriend. Then he responded with things like sending her teeth down her throat. He got screwed badly , wasn't that a Japan card? Yeah, I'm surprised he got screwed by his own people. YES! My boy Takeya will smash this dude. Give him his win streak; should be 3. The picture Ronda posted with the carraway seeds and the caption "guess I'm on the same diet as meisha" was genius.